Fiber reinforced substructures for an implant supported framework. Fiber reinforced substructures or frameworks for the implant supported denture are possibly the future. They have so many great advantages and I have gotten into using them on certain cases. Advantages of the fiber reinforced substructure or framework. Fiber reinforced substructures are cheaper and easier to make. If one breaks it is not a huge ordeal to just mill a new one. The main issue is that they are new, only a few years old, so we don’t know what we don’t know yet. I believe this is where we are all headed. However, high performance polymers like Pekkton are also possible future contenders for frameworks. I use both and do not have a strong opinion on either yet. As the years pass I expect to see more research come out about these products and their longevity but I also expect to see similar products that are even better! Fiber reinforced products in dentistry. 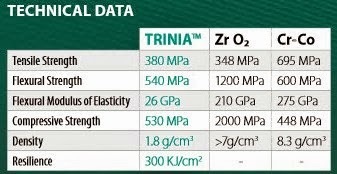 Trinia is one example of a fiber reinforced resin that we use. Jim Collis CDT did a nice article on the technique in dental lab products. We can also use Fiber Force mesh in dentures. Trilor is yet another product and it is very similar to Trinia. For more information on framework options check out our all on 4 framework options post! Some issues with fiber reinforced substructures and frameworks. Fiber frays and can degrade if left exposed to the oral environment. Products like Trina and Trilor must have a composite covering them. Finally, there is of course the unknown factor, as these products are not widely in use and are newer. Fiber reinforced substructures have fibers that fray! This is a Trilor puck and you can see fibers in multiple areas. These will cause in issue if we leave these open to the oral environment. It is not a big deal but we must ensure all areas have either a porcelain crown or composite covering them.